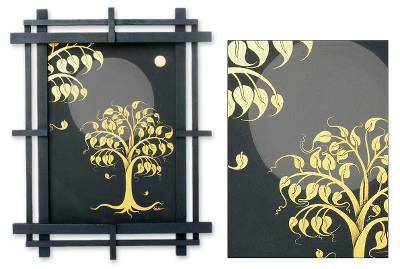 The golden leaves of a sacred pipal tree blossom under the spell of the full moon light. Painting with acrylics, Parinya Nanjai intends for Earth to be represented by the gray circle in the background. The pipal is a variety of fig that grows in India. Buddha achieved enlightenment while meditating beneath such a tree, which then became known as a bodhi, or "enlightened" tree. Some of these trees in Thailand are said to derive from cuttings of the original bodhi and are also known as bo. Nanjai frames his inspired composition with rubber tree wood. You can find 'faith of the Golden Bo Tree II' by Parinya Nanjai in paintings categories such as Spiritual Paintings, Folk Art Paintings and Acrylic Paint Paintings. Enjoy exploring these sections for other Novica treasures. Parinya Nanjai has a feeling way of painting that visually you experience a sptitual connection. Thank you for this beautiful rendition of the tree of enlightnment. I believe that trees are the very soul of the earth, no wonder great wisdom is often found in contemplation beneath a familiar friend. Please continue your wonderful and thoughtful work! I received your painting Cave Lions. Your work is exceptional. Painting I received was very beautiful and you have paid lots of attention to the smallest details. However I suggest you to get some better services on canvas stretching and framing for such a beautiful work of art. I felt canvas should have been stretched more tightly. Overall I liked your work and am happy with it.